Undoubtedly our most prestigious venue to date, the Southwest Museum Gallery hosted a wonderful show. I even sold one of my favorite paintings. 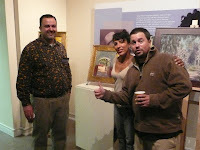 Here I am with Jennifer McChristian and hubby Ben posing in front of my piece "Threshold".